NK5, a leading player specialized in turning around and investing in enterprises facing financial and/or operating difficulties, has announced the sale of Baux, the Spanish industrial group devoted to the production of hot- and cold-rolled and lacquered aluminum products from 100%-recycled materials, to Jupiter Aluminum Corporation. Under the ownership of NK5, the Baux companies lifted their revenue to over €200 million in 2017. And in 2018, they have posted a considerable improvement in earnings from 2017. Today, Baux is one of the top 5 players in its sector in Europe. Baux became part of the NK5 portfolio in January 2017 after its intervention, starting in July 2015, to save the group and restructure its finances as a part of plan designed to reinforce its financial structure and business management. The group was being dragged down by recurring losses and high leverage. This situation, aggravated by an economy in crisis, was driving Baux towards a non-viable business situation. The role played by the creditor banks, led by Banco Sabadell, which supported the restructuring effort with new working capital facilities and capex funding, was key to re-floating Baux. In parallel, in the context of the growth plan designed at the time of the acquisition, the management team was professionalized by putting renowned businesspeople on the Board of Directors. Juan José Nieto, executive chairman and founding partner of NK5, said, “This is a very important transaction. Very important for NK5 because it is the perfect example of what we want and know how to do; very important for Baux, which three years ago was on the verge of disappearing and is now an international leader with over 300 employees and promising growth prospects; and very important for Jupiter Aluminum because it is embarking, with a major leap, on its international expansion with a highly professional team and a company which is strongly and profitably positioned vis-a-vis its markets and customers. The ability to rely consistently on Banco Sabadell for its support has been key to achieving our objectives”. Aluminum recycling has been the heart of Jupiter Aluminum since its foundation in 1992 by Dietrich Gross. Based in Chicago Illinois, Jupiter Aluminum can be seen as a sister company as its equipment, processes and markets are very similar. “At Jupiter we focus our efforts on ensuring that all of the stakeholders in our business work together as a team to ensure success” said Paul-Henri Chevalier, President of Jupiter Aluminum. “Our employees, clients, suppliers, and agents all form a crucial part in obtaining a well-run machine. We felt this equilibrium immediately when we visited the Baux plants in Segorbe and Elche de la Sierra”. Dietrich Gross added, “We believe that the company has the same philosophy and skill set as Jupiter and we are convinced that together we can continue to grow as a truly international business. In other words, Baux is a natural extension of Jupiter Aluminum”. “This is our first international transaction, but we are very comfortable with Baux because it is exactly in the same sector as we are. We can also depend on an excellent relationship with NK5 and Banco Sabadell, our advisors, Livingstone Partners, and an outstanding management team”, concluded Mr. Chevalier. Sabadell Corporate Finance acted as the seller's financial advisor and Freshfields Bruckhaus Deringer as its legal counsel on the transaction. Jupiter Aluminum Corporation used the financial and legal advisory services of Livingstone Partners and Quáter Abogados, respectively. Grupo Baux is comprised of Compañía Valenciana de Aluminio Baux and Bancolor Baux, devoted, respectively, to the production of coils from recycled aluminum (in Segorbe, Castellón) and the coating of aluminum slats (in Elche de la Sierra, Albacete). It currently has 330 employees and contributes proactively to the circular economy thanks to a productive process articulated around the constant recycling of aluminum. It boasts production capacity, between hot- and cold-rolled and lacquered aluminum, of over 100,000 tonnes. 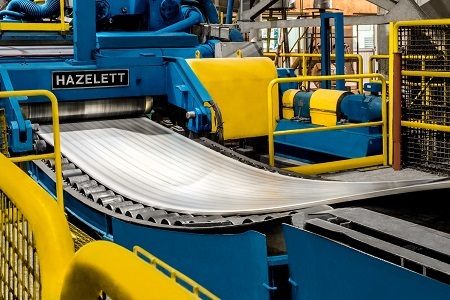 With annual production capacity of 125,000 tonnes, a process fueled 96% by recycled scrap and revenue of close to $400 million in 2018, Jupiter Aluminum has three manufacturing facilities: a scrap processing center in Indiana and two painting factories in Indiana and West Virginia. Baux's meaningful presence in Europe will complement the market share Jupiter has established for itself in the US producing aluminum products for the government sector and the construction and building industry. The two firms are highly complementary. NK5, founded in 2015, restructures, manages and invests in companies facing financial and operational instability. It is chaired by Juan José Nieto, whose professional experience includes executive positions at Goldman Sachs, Bankers Trust, Telefónica and Antena 3, and who sits on the boards of a number of listed and unlisted companies. NK5's two Managing Directors are Manuel Roca de Togores and Pablo Gimeno, who between them boast experience with over 120 turnaround and bankruptcy stories at prestigious firms over the last 15 years.